Arielle Phiencel is a Breton nightblade who sells spells at the Mage's Guild in Wolverine Hall near Sadrith Mora. She is involved in two quests, one for House Telvanni and one for the Thieves Guild. 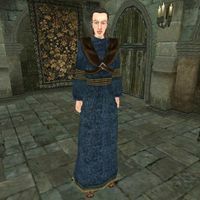 She wears a common robe with matching shoes, and she carries a steel jinkblade, as well as a silver staff sought after by Telvanni Master Neloth. Staff of the Silver Dawn: Find this magical staff somewhere in Sadrith Mora. Wizard For Hire: Hire a battlemage to protect the guild. "Yes, I have a Staff of the Silver Dawn. I don't use it very often. I prefer daggers, myself. I'll sell it to you for 300 drakes." Give her 300 drakes. : "I'm sorry, but you do not have 300 drakes." Nevermind. : "Well, your loss. I'm sure it's worth more than that." "I already sold you the Staff of the Silver Dawn." "I no longer have a Staff of the Silver Dawn." "Yes, I could arrange for a wizard to guard your precious guildhall. But first you must bring me four pieces of raw ebony for an experiment. If you bring me the ebony, I will send you a guard." "So do you have the ebony?" Yes, here they are: "Yes, these are all fine samples. I will send one of our fine Battlemages, Natalinus Flavonius, over to Dirty Muriel's." No, not yet: "No ebony, no guard for your guildhall." "Yes, I have sent you a guard." "I don't care what happened to him, all transactions are final, and I'm not sending you another guard. Battlemages don't grow on trees, you know." "I don't know where you can find it. Buy it. Steal it. Mine it yourself. I just know what I need if you want to hire a wizard." This page was last modified on 23 November 2018, at 07:30.